I don’t usually name seasons for the activities they bring. You know, like Steinbeck’s “Winter of our Discontent”, but this one brought lots of good stuff which culminated in my becoming well-acquainted with several nice men in the medical profession. First, the good stuff included a lovely trip to Carmel, courtesy of our family to celebrate our amazing 65th anniversary. Amazing because neither of us is old enough to have been married that long. We basked in the sun, shopped till our legs felt weak, dined in style, and spent the evenings enjoying the sunset while overlooking the ocean and large resident flock of sheep who looked as if they never missed a meal. Arriving home, our children and grandchildren put togther a grand party for 65 people in two days that would have taken me a month in my best days. So much for good genes. They obviously did not get them from me. And that’s the last of the good stuff. Next came the matter of repairs. First came cataract surgery, which today is a piece of cake. You get a bigger and better exam than usual, and in my case, was told that I am “color deficient”, which to the uninitiated, is color blindness. This, and I have been fooling the public and my students for years that I knew what I was doing. Then they treat you ever so nicely while you wait your turn among a roomful of old people. “Why am I here?”) When I got into the tidy little OR (that’s short for operating room) the doctor I already didn’t like because of the color blindness crack, said abruptly “Well, I hope you don’t cough.” (That’s because I DO have a coughing problem.) Not the beginning of a great friendship. I felt like doing it anyway except he was the one with the scalpel. This led to new glasses of course, which were much stronger, and very expensive, but introduced me to a charming young optometrist I could really get to like, so that could be added to the good stuff, because I probably will have to see him again sometime. OK. All is going along beautifully, until a bad toothache told me I had come to the end of the line, and would have to break up the lifelong friendship I have had with my teeth. My charming nephew told me one day “Auntie, I can’t patch you up anymore.” He went into the next room while I pondered just what he had in mind. When he came back into the room I was having a lovely conversation with one of his cute nurses, so I was relaxed and unprepared when he said that all the teeth on the bottom had to go. They were no longer carrying their part of the load. What the hell did this mean? Next I went to visit the oral surgeon, who made an appointment for me to come in and he would happily remove them all and give me two (or maybe 4) implants Easy for him to say. It’s me that will have to suffer the pain and sacrifice and economic disaster. I have a deeprooted belief that suffering will make me a better person, thanks to my grandma Nellie. Who by the way was a Christian Scientist, and didn’t believe in pain and suffering. It simply was not there. It’s that kind of upbringing that makes you an agnostic. Surgery day came and out came the teeth. All of them. I kid you not. The surgery is not bad (I might add that there were a number of teeth which were broken off at the gum, ) and I was in dreamland during the process. Not as bad as I thought. After all, I had lost all the upper ones some time ago and survival is possible. Dr. Advice had a good time giving advice about putting my food into the blender, and calling my new teeth “choppers”. That’s OK for him to say, but just try putting the Thanksgiving turkey into a blender. But all is wll, and I have gorgeous new teeth, which will be the envy of all the other old ladies I know, and maybe even the young ones. Now I just have to get them to work. And more good stuff. I no longer have to brush and floss after every meal. And when someone says “Say cheese” with a camera pointed my way, I can grin with the best of them. As an artist, I am a people watcher. I may not remember your name, but I will always remember your face. I remember a woman I never met who was sitting on the front steps of an apartment building ten years ago. She was a black woman wearing a bright dashiki and a colorful scarf around her head. I longed to paint her, but I was caught in traffic, and late for an appointment. Her expression while watching the traffic going by her apartment building was sad, and I imagined various reasons for her pensive gaze. There are numerous faces which often flit through my mind. I watch and mentally sketch the contours of their faces and bodies, or draw them in air or on the tale with a finger. Sometimes I form the images of faces in the patterns which pop up in carpets or even floors. Crazy. Even crazier is when I try to find them again the next day, and they have gone. There were the old couple in the corner on the soft chairs reading the New York Times. And just where did all these very tall, very thin and knock out beautiful girls in tight designer jeans and boots with skyscraper heels come from? Busy people, rushing to get to work, flash in and out with their mid-morning caffeine fix, while a couple, obviously not married, were chatting it up. He, perhaps in a mid-life crisis, leaning too hopefully toward her while she, half his age,was looking a bit doubtful about the whole thing. A microcosm of coffee shop life, repeating itself daily, and always fascinating to a people watcher. Where do they go, what is their job, what are their problems, what is their life? Then suddenly, it was my turn at the counter and the barista knows well what my order will be: a vente caramel latte, whole milk, extra whipped cream and extra caramel on top. Oh, and a tall coffee for Dr. Advice. Well, baseball is over for the year, and college football nearly so, and now it’s on to watch those overweight and overpaid professional behemoths trying to break one another’s bones each week. We met with friends for the weekly tailgate party at 9 or 10 in the morning, and ate great snacks and drank good wine, and then at the sensible hour of 12 or 1, we traipsed into our seats in whichever stadium we were. And I sat beside other women who didn’t know anymore about the game than I. We braved it out for 3-4 hours and then told each other we would see them next game. Today’s games don’t begin until 7:30 at night, so that TV can present them to people who stay up later than I. Then my daughter got engaged to a football player at his university. For some reason I forget, I went to the game with my other daughter, who really WAS a cheerleader and who knew all the rules. My daughter is kind, thoughtful and patient, and gave me a 3-4 hour primer on the game of football. I have to say, it makes the game infinitely more interesting when you know what’s going on! I still am unfamiliar with all the finer points, but I can live with that, and Dr. Advice is very proud of me anyway. But one thing is still ridiculous to me. In baseball, so as to confuse the opponents, the catcher does strange things with his hands in front of his groin as he is squatting, so as to tell the pitcher what to throw, and even sillier in football is holding one’s hand over the mouth to whisper the plays. Some quarterbacks even wear a small electronic cheat sheet on their wrists to remind themselves of plays. I have favorite teams I root for of course. The University of Washington, Cal and Stanford, though not when they are playing one another; then it’s a draw. Dr. Advice would disown me for rooting for Stanford, but I can’t help it, after all, they are just around the corner, so they really ARE the home team, and red is a great color! Julian Barney defines the difference between youth and age: “When we are young, we invent different futures for ourselves. When we are old, we invent different pasts.” We have no regular rite of passage prompting people to do so. But it’s hard to tell a story before it ends. We are not blank slates. David Brooks correctly states that we are players in a game we don’t understand. Our perceptions and memories are slippery, especially regarding our own roles in the game. It seems that old people regularly rewrite history, purposely or not. I have a friend who says “it doesn’t matter if it’s true or not, as long as it’s interesting.” I have to agree, because does it really matter to anyone if Aunt Hazel had two cats or ten? However it isn’t just the women. The hairy sideburns of the ’70’s, went well with the plaid golf pants and the gold chains, but today? I don’t think so. Dr. Advice luckily never invested in the gold chains for himself, and that’s a good thing, but he did have the golf pants. And you know about the new look today: all it takes is looks and a whole lot of money. She lived in a large old Victorian house which had been built by my Great Grandfather in the 19th century. My husband and I rented the third floor attic from her for three years for the exhorbitant amount of $35 per month when we first married 65 years ago. 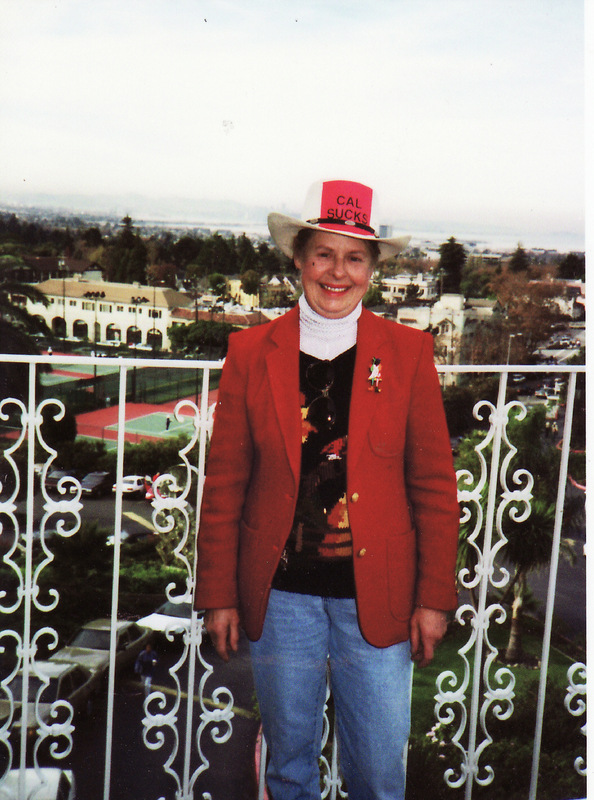 Aunt Helen was a larger than life individual with strong opinions, but a grand sense of fun. Her colorful conversation was scattered with outrageous observations, many of which dealt with her painful feet. She wore old-fashioned “sensible” shoes, except on bridge days, when she put on her one pair of dress-up shoes, which she referred to as her “sitting shoes”. She remained a farm girl who happened to live in the city. Upon arriving home from an afternoon of bridge, and before removing her hat, girdle or dress-up shoes, she quickly chopped up an onion and put it on the stove to work its odiferous magic. Uncle Fred worked in San Francisco and had taken the ferry to and from Alameda each day for 40 years. Arriving home at precisely 5:30 every day and entering by the front door, at approximately the same time as Aunt Helen was coming in by the rear door, he was able to smell the delicious and intoxicating odor of onions cooking, and contentedly settled his portly little body into his large comfy chair to read the evening paper. Misleading, yes, but comforting to a weary husband after a hard day’s work. Today’s version might be a welcoming glass of wine rather than an onion, and possibly today’s husband might even chop the onion!